Wild Guess Preview: There’s corruption afoot at Ye Olde Historick Gift Shoppe, as a cabal of historical reenactors are skimming profits from tourists buying colonial lighters and Christmas ornaments. The A-Team helps a group of nearby teenagers win back the business and turn it into Ye Olde Historick Heade Shoppe, selling bongs and bead portraits of Jerry Garcia dressed in pre-revolutionary clothing. The Recap: We start the first non-pilot episode with two non-pilot elements, a very Dragnet-style narrated intro from Hannibal and a pre-show montage, which shows some great clips of fire and wisecracking and OH MY GOD is the A-Team really fighting John Saxon? Season 1 is officially in high gear now, because Saxon was (and is) the gold standard of TV villains. Usually a series has to work their way through lesser villains – guys on the level of, say, Fred Asparagus – before making it up to Saxon. Hell, C.S.I. didn’t get to Saxon until like season six, but here he is episode three! 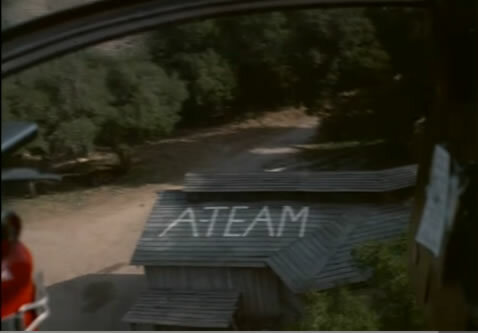 Hannibal’s voiceover explains that the A-Team is in Redwood, California to rescue a girl called Sheila Rogers from a religious cult in Redwood, California led by Saxon’s character, Martin James. 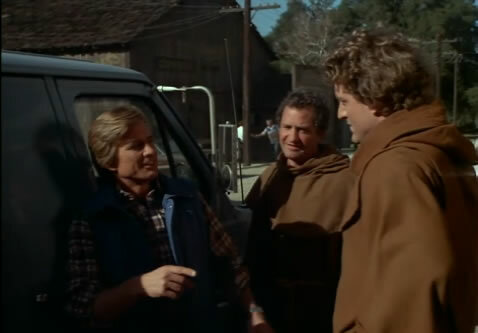 Face – Dirk Benedict Face, not Smilin’ Tim – is already on hand to meet some of them, and he cracks wise about their tunics before reporting back to the team, which is waiting nearby in the A-Team van. This is the first appearance of B.A.’s iconic van (in the pilot he drove old jalopies, K-cars and a giant Mexican school bus), and man she is a beaut, especially compared with the pastel blue vans the cult likes to drive. This Sheila person’s dad is with Murdock, by the way, and I think he’s wearing the same white suit that Al Massey wore in the pilot. Why is every dude the A-Team works with dressed like Colonel Sanders? Anyway, Hannibal’s plan is for Triple A and Face to pretend they’re a couple having a spat in the local general store. Hannibal pretends to intervene, Face pretends to get in a fistfight with him, and then Triple A pretends to not be dragging Sheila into the van while Hannibal and Face break the shop’s giant plate glass window. They peel out in the van, the cult dudes try to give chase but Hannibal put fish hooks under their tires! Wow, that was easy! I thought this show was longer. B.A. drives everybody to a rendezvous point, where Murdock, Sheila and Colonel Sanders- er, Sheila’s dad take off. This is when the shooting begins, and B.A.’s van gets a flat. Hannibal says “I love it when a plan comes together” for no apparent reason and B.A. exhorts him to come up with a new plan in a hurry. The plan is that they give themselves up, but Murdock decides he’ll drop off the Rogerses and then come back to blow many things up. Hannibal, Face and B.A. taunt the cult dudes by saying they probably wear pantyhose under their tunics. As such, this episode violates several religious hate crime statutes in Canada, which forced the producers to reimagine the show entirely for foreign syndication. In “Children of Jamestown (Canadian Edit),” John Saxon is a deranged cereal manufacturer who force-feeds Franken Berry cereal to eight year olds for weeks on end, and is only defeated when Hannibal removes the butter pat from Saxon’s complete breakfast. Grisly stuff. Y’know, there are a lot worse ways to go out than being executed by a crazy cult led by John Saxon. To recap: the cult guys take the A-Team, minus Murdock, to their creepy compound, and John Saxon, looking suave and evil in his shades and Johnny Cash outfit, tell the tunic dudes that “they’ll be made to pay” for stealing Sheila away, though it’s just as likely he’s upset the A-Team van is nicer than theirs. They’re sent to a sort of roomy cabin, where Triple A freaks out about her imminent death. B.A. has to explain to her that facing death “gives us the edge.” Face adds that Triple A should “accept death… it calms you.” Guess I didn’t need to buy those Thich Nhat Hanh books, cause I’m getting plenty of Zen here in my prime time TV action series! (Bet “Airwolf” couldn’t do that!) None of this is any comfort, so finally B.A. just says fine, I’ll make sure you don’t get hurt, and that does the trick. Then it’s time for their show trial! John Saxon opens the ceremonies by reciting a creepy goth-style poem along the lines of “The Lord shall prevail where evil shall wail.” B.A. takes the measure of the man pretty well: “This man’s a pothead, Hannibal… he’s high on smack or speedballs or something.” Hannibal recites “Hickory Dickory Dock”, which flusters John Saxon enough that he sentences them to a trial. Uh, isn’t that a little backwards? Oh, this is “trial” meaning “denoting distress or suffering that severely tests resiliency and character.” Then he takes them outside and makes them put on gym shoes?!? Oh, they have to run away so the tunic guys, who now have Jeeps instead of vans, can hunt them down. It’s “Surviving the Game” all of a sudden! I’m only halfway through episode three and I’m pretty sure I’m going to be tracing the entire history of modern entertainment to A-Team plots. I’m not sure yet how I feel about that. The team seeks aid from a local farmer, who offers help reluctantly because he saw John Saxon on “Hardcastle and McCormick” and doesn’t want to make him mad. Hannibal and the farmer look for stuff they can turn into makeshift weapons, while Face starts making time with the farmer’s daughter. There’s a nice construction montage which shows all the cool stuff they’re building, except weren’t there like five Jeeps about 30 seconds behind them? Did the tunic dudes all go on lunch break? The farmer wonders why they don’t all just take the Jeep and run, and Hannibal says he wants to free the remaining kids at the compound – “besides, he stole my boots… nobody steals my boots.” Zing! Hannibal and B.A. turn a Jeep into a super-flame-death-laser thing and start riding back to the compound, which is like 200 yards away. They start blowing everything up and John Saxon freaks out and is all “Brothers, I’m in danger!” but now Hannibal is on the jazz and he’s shooting at everybody. Murdock – yeah, remember him? – is back to help, and he thought helping would be easier with two big boxes of dynamite. And Face, Triple A and the farmer and farmer’s daughter have a secret weapon of their own, too – a sort of propane tank cannon thing. Murdock dropping dynamite on druids – man, if there’s a pyro in your family, call them over to the TV right about now. As it turns out, John Saxon’s amphetamine-fueled ranting is a weak defense against homegrown flamethrowers, so when Hannibal instructs him and the remaining tunic dudes to surrender “or you’ll be medium rare,” they wise up and do as they’re told. 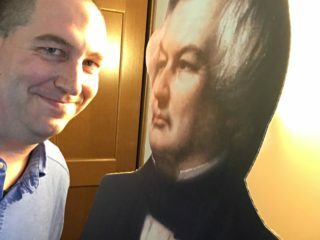 Now that all is said and done, Face has a little time to romance the farmer’s daughter with an explanation of “the jazz,” but Murdock interrupts and tells the gal that Face has a bubble bath fetish, so time only for one kiss and a thank you from the now freed kids. Oh, and also, time to pick up Hannibal’s boots! A seriously fun episode. John Saxon is truly in his element as a looney cult leader, Hannibal gets lots of good lines, and while Dirk Benedict doesn’t yet own the role of Face, he’s certainly put a nice down payment on it. Take that, uh, whoever it is that plays Face in the new movie!